A Soldier Marched into Heaven on Tuesday, January 22, 2019. 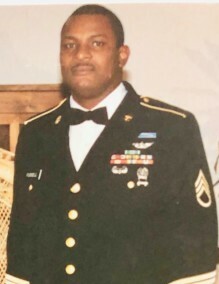 Staff Sergeant Lamar Fussell: a beloved husband, father, grandfather, brother, soldier, and friend was born February 24, 1959, in Douglas Georgia to the late Ruby Mae Fussell Littleton and Benny Lee Hodge. He attended and excelled at Coffee County High School where he skipped to the 10th grade and received a Co- Scholastics Award. He often considered himself smarter than the teacher and told those around him that he was a genius. After graduating with honors, SSGT Fussell enlisted in the United States Army, He served his country in many duty stations, including Ft. Sam Houston where he met and married his beautiful wife of 38 years, Sandra Kaye Lewis Fussell . Together they traveled the world to duty stations in Germany, Virginia, Japan, and the Middle East. He worked in aviation and was responsible for the repair of military aircrafts such as Chinooks, Hueys, and Black hawks - he kept them “birds" flying. After retiring in 1996, He went to work for the United States Postal Service as an engineer. He was a hard worker and attacked every task with 110% effort. Throughout the course of his career, Lamar received many awards and accolades, including receiving a degree in mechanical science. He was also kindhearted and giving, never hesitated to take time out of his busy schedule to help anyone in need. Lamar loved his family and enjoyed spending much time with them whether it was on vacation, camping trips to Jacobs Creek Lake, or visits back home to Douglas. He had an adventurous spirit and often did accelerating tasks such as climbing jumping out of helicopters, climbing Mt. Fuji in Japan, diving off cliffs at Canyon Lake, and riding the thrilling rollercoasters at amusement parks. He was an Avid reader, especially nonfiction mystery novels and a sports fanatic. He loved the Oakland Raiders win or lose; and wouldn’t venture out into public with his beloved Raiders cap (worn backwards because he believed he was "cool"). He also enjoyed playing sports often times riding his bike to Randolph AFB and playing a round of Basketball with his son, Marlon, and other soldiers on base. He was in a basketball league with his son, Charles, while stationed in Japan. Lamar was preceded in death by his mother Ruby Mae Fussell Littleton and father Benny Lee Hodge; two sisters: Carrie A. Denning and Shirley Ann Gilford; two brothers: Carl Anthony Fussell and Norris Fussell. He leaves to cherish his memory his beautiful devoted wife of 38 years, Sandra Kaye Fussell; one daughter, Shayla Nicole Fussell; two sons Charles Fussell and Marlon Fussell all of Converse, Texas; three sisters: Debra(Peter) Dobson, Audrey(Grady)Hodge, Brenda Gail Littleton(Leroy); six brothers, Amos(Linda)Fussell, Greg(Kimberly)Fussell, all of Douglas Georgia, MSgt Jerry Fussell of Cincinnati, Ohio, Ricky (Trudy)Fussell of Michigan City, Indiana, Hurbet Littleton, Jimmy Littleton(Sandra) both of Douglas, Georgia; eight grandchildren; and a host of nieces, nephews, cousins, and Friends.